Appalachian Trail Conservancy Offers Workshops on "How to Hike the Appalachian Trail"
For those wanting to learn more about a trek on the Appalachian Trail, now’s your chance! The Appalachian Trail Conservancy (ATC) will offer 10 classes throughout North Carolina and Georgia in January and February 2016 for people interested in long-distance hiking. Courses will be taught by Hiker Education Accredited instructors, or individuals who have worked with the ATC to offer a comprehensive workshop that encourages enjoyment and protection of the Trail. The courses will cover all aspects of planning a long-distance hike on the A.T., from essential gear to the diversity of the Trail experience. Participants are encouraged to find their own personal approach to hiking the Trail, while also includes being well-prepared, responsible hikers. For a full list of workshop dates and locations, please click here. The Appalachian Trail Conservancy (ATC) continues to see a record-breaking number of hikers who pass through its Visitor Center in Harpers Ferry, West Virginia, which is considered the psychological midpoint of the 2,190-mile long Appalachian Trail (A.T.). This increase can partially be attributed to the recent releases of “A Walk in the Woods” and “Wild,” two major motion pictures depicting hikes on long-distance trails. According to the ATC’s records as of this December, 1,385 northbound thru-hikers, or those who walk the A.T. from Georgia to Maine, have passed through Harpers Ferry, resulting in an increase of 9 percent over last year’s data. The number of southbound thru-hikers, or those who walk from Maine to Georgia, has increased by 14 percent to total 192. The number of those who choose to thru-hike the A.T. in an alternative, non-contiguous way that disperses use has increased dramatically, with 291 people passing through Harpers Ferry, an increase of 139 percent. Upon arriving at the ATC’s Visitor Center in Harpers Ferry, hikers who are attempting to complete the entire Trail are photographed in front of the iconic “Appalachian Trail Conservancy” sign. 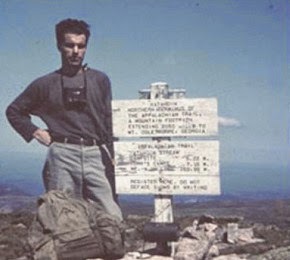 The picture, along with other information about the hiker, is documented at the Visitor Center. This year the ATC has seen not only a significant increase in the amount of long-distance hikers who stop at the Visitor Center to be photographed, but also an increase in visitation overall. Since the release of “A Walk in the Woods” on Sept. 2, the number of visitors at the Center has increased more than 50 percent. The movie has sparked interest in the A.T. among a broad range of people, inspiring new audiences to learn about and explore this national treasure. 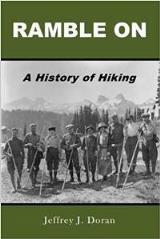 The ATC’s plan to protect the A.T. hiking experience, which is currently being implemented by A.T. stakeholders, focuses on four main areas: hike planning and registration; a visitor use analysis; the creation of new campsites and restoration of existing sites; and an increase in education and outreach initiatives. The ATC is seeking $1.3 million to fully implement this stewardship plan. To learn more about how the ATC intends to protect the A.T. hiking experience, visit www.appalachiantrail.org/awalkinthewoods. Tennessee State Parks will sponsor free, guided hikes on New Year’s Day. Each state park will host its own special hike in the first few days of the New Year. The First Hikes begin at 10 p.m. on December 31st at Pickett State Park. Norris Dam, Roan Mountain, Tims Ford and Mousetail Landing state parks will host midnight hikes. The First Hikes will continue throughout New Year’s Day with morning, afternoon and evening hikes. From Reelfoot to Henry Horton to Roan Mountain and every state park in between, the 2016 First Hikes are designed for all ages and abilities. Some hikes will be approximately one mile in length and tailored for novice hikers, while others are lengthier and geared toward more experienced hikers. For a more in-depth look into planned First Hikes in your area, please click here. Tennessee State Parks’ First Hikes of 2016 are part of America’s State Parks First Day Hikes initiative in all 50 states. Is a trek to Everest Base Camp in your future? Is a trek to Everest Base Camp in your future? Perhaps after watching this short video you might be enticed to put this epic trip on your bucket list! Ian Taylor, one of the newest advertisers on our Rocky Mountain, Glacier and Grand Teton hiking websites, recently sent me a link to one of his videos showing what it's like to trek to Everest Base Camp. To date, Ian Taylor Trekking boasts a 99% success rate on this trek. That's important to know, especially when you consider that this round-trip trek takes 16 days to complete. No doubt, this trip isn't for everyone - trekkers will reach heights above 18,000 feet after ascending to the summit of Kala Pattar on day 11. In addition to Everest Base Camp, Ian also offers guided climbs on peaks in the Mt. Everest region, as well as Mt. Kilimanjaro in Africa, Mont Blanc in France, Denali in Alaska, and Mt. Rainier in Washington, among many other trips. For more information on this awesome trek, as well as all the other guided trips Ian offers, please click here. Great Smoky Mountains National Park announces the 40th annual Festival of Christmas Past celebration scheduled on Saturday, December 12 from 9:30 a.m. to 4:00 p.m. at the Sugarlands Visitor Center. The event, sponsored in cooperation with Great Smoky Mountains Association, is free to the public. The festival will include old-time mountain music, traditional harp singing, mountain craft demonstrations, and living history walks. Demonstrators will show visitors how to make historic toys, games, rag rugs, apple-head dolls, quilts, homespun thread, and apple cider throughout the day. Visitors can also experience these traditions through hands-on activities including make-and-take craft stations. The popular Christmas Memories Walk will be held at 11:00 a.m. and 2:00 p.m. Costumed interpreters will lead a short walk from the visitor center and talk about life in the mountains during the holidays. Through this living history program, visitors will experience the spirit of the season in the mountains during the early days. If you do plan to visit the Smokies this Christmas season, please take a few moments to check out our Accomodations Listings for a wide variety of lodging options in Gatlinburg, Townsend, Pigeon Forge and the North Carolina side of the Smokies. The Appalachian Trail Conservancy announced last week that a record-breaking 6,827 volunteers reported approximately 272,477 hours in maintaining and protecting the Appalachian Trail during the 2015 fiscal year. Since the ATC began collecting reports in 1983, individuals have contributed more than 5 million hours to the A.T., resulting in a volunteer network that is recognized worldwide. The record number of both volunteers and hours reported reveals a loyal commitment to the Trail. Volunteers donated time equivalent to what is completed by 131 full-time workers and contributed to a wide variety of projects, including maintaining the A.T. corridor, monitoring and removing invasive species, supporting teachers in the Trail to Every Classroom (TTEC) program, assisting A.T. Communities near the Trail, and preparing for the ATC’s biennial conference, the organization’s official member gathering held every other year. The ATC’s volunteers represent 31 A.T. Maintaining Clubs and Trail Crews; Visitor Center and regional office volunteers; and participants in additional ATC programs, such as TTEC and the Appalachian Trail Community™ program. 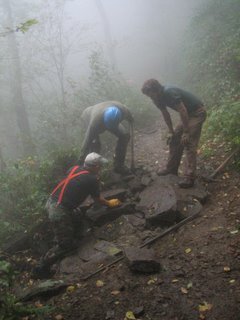 Though Trail maintainers are perhaps the most visible, volunteers also participate in many other activities, from community outreach to local, regional and Trail-wide management efforts. For more information about volunteer opportunities, visit www.appalachiantrail.org/volunteer. Great Smoky Mountains National Park is inviting visitors to join them for a series of ranger-led hikes across the park on Friday, November 27. Hikes will be offered in the Cataloochee, Elkmont, and Cades Cove areas of the park providing an outstanding opportunity for people of all ages to #OptOutside and enjoy the park. Rangers, park volunteers, and Friends of the Smokies staff will help visitors discover special cultural and natural resources along the hikes. Visitors may also choose to hike on their own and can come to any of the park’s visitor centers throughout the Thanksgiving holiday weekend to receive information about hiking options, including several short nature trails that are perfect for children. The park has over 800 miles of trails to explore throughout the year with every season offering its own special rewards. During late fall and winter, the absence of deciduous leaves opens new vistas revealing stone walls, chimneys, and foundations. These reminders of past communities allow hikers to discover a glimpse of history along park trails. Join park staff for a 5-mile, roundtrip hike to one of the largest waterfalls in the park. The hike is rated moderate with several steep, rocky sections. Expect 4 hours total for the hike. Participants will learn about the parks 2,900 miles of streams, wildlife that depend on the streams, and the significance of Abrams Creek to the diversity of the park. 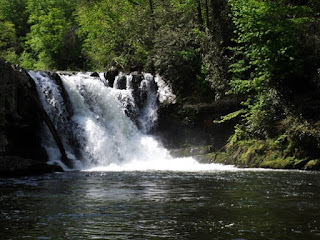 Meet at the Abrams Falls Trailhead, halfway around the Cades Cove Loop Road at 10:00 a.m. The program is subject to cancellation if the weather is bad. For more information, call Cades Cove at 865-448-4104. For more information on this outstanding hike, please click here. The 5-mile, roundtrip hike on the Little Cataloochee Trail is rated moderate but does have several steep sections. The trail follows an old road that provided access between Big Cataloochee and Little Cataloochee in the past. Stops on the hike include the Hannah cabin, the Little Cataloochee Church and cemetery, and the Cook cabin as well several former homesites. 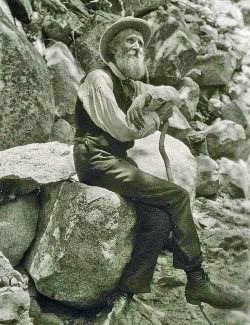 The ranger leading the hike will have historic photos and maps of the area to share with participants. The guided portion of the hike will end after 2.5 miles at the restored Cook family cabin. Participants can return to their cars at their own pace or further explore the area. Meet at the parking area on the left just after entering Cataloochee Valley. From there, participants will follow the ranger and drive 5 miles to the Little Cataloochee trailhead. The best route into Cataloochee is Cove Creek Road which is accessible from Hwy. 276 near its intersection with Interstate 40. Participants driving to the area on I-40 should use Exit 20 (Hwy. 276 exit) and immediately turn right on to Cove Creek Road. The drive from Hwy. 276 into Cataloochee is 10 miles. Cove Creek Road is a winding, two-lane road and includes a four-mile section that is unpaved. For more information, call the Oconaluftee Visitor Center at 828-497-1904. This easy, 4.8-mile roundtrip hike follows the river through a beautiful, cove hardwood forest. Participants will learn about the rich history of the area including the logging operations of the Little River Lumber Company. Expect 3-4 hours total for the hike. One river crossing may be required. Meet at the Little River trailhead at 9:00 a.m., 7 miles west of Sugarlands Visitor Center in Elkmont. 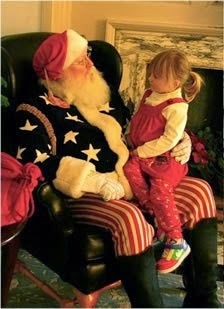 For more information, call Sugarlands Visitor Center at 865-436-1291. For more information on this hike, please click here. 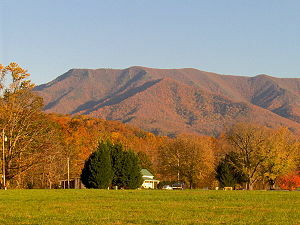 What to bring: Weather in the Smoky Mountains can be unpredictable, especially in the fall. Rangers recommend participants dress in layers, wear sturdy shoes, and bring rain gear. Participants should also bring a bag lunch, snacks, and plenty of water. Great Smoky Mountains National Park fire management officials will make a final attempt at a 600-acre prescribed burn in the Canadian Top project area adjacent to Cataloochee Valley in North Carolina. Weather permitting, burn operations will begin on Saturday, November 21. Crews should be able to complete the burn on Saturday, but smoke may be present in the area through Sunday. The burn unit is located on Bald Top and Jesse Ridge adjacent to the Little Cataloochee Trail between Davidson Branch and Mossy Branch. This prescribed burn is one in a series of low-intensity controlled burns used over a number of years to restore the oak woodlands on the area's upper slopes and ridges. This will be the second time fire has been used on this site as part of that restoration effort. Fire and drought-tolerant natural communities are important to overall ecosystem health, and they are in decline throughout the Southern Appalachian region. The controlled burn will be conducted by national park staff and is being funded by the Rocky Mountain Elk Foundation. "One of the goals of the prescribed burn is to improve elk forage and habitat," stated Great Smoky Wildland Fire Module Leader and Burn Boss, Shane Paxton. Over time, the increase in herbaceous vegetation on the forest floor will improve forage for elk which graze the nearby meadows. Roads and trails will remain open to the public though temporary closures to the Little Cataloochee Trail may occur if fire activity warrants. Visitors should expect to see smoke in the area. Designs for commemorative coins honoring the 100th anniversary of the National Park Service (NPS) were unveiled today during a ceremony at the Department of the Interior. NPS Director Jonathan B. Jarvis and National Park Foundation (NPF) President and Chief Executive Officer Will Shafroth joined Treasurer of the United States Rosie Rios for the unveiling. 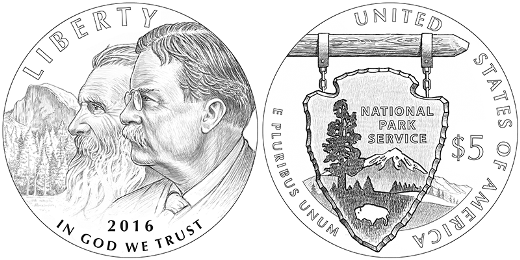 Public Law 113-291 authorizes a three-coin program of $5 gold, $1 silver and half-dollar clad coins with designs emblematic of the 100th anniversary of the National Park Service. Pricing for the National Park Service Commemorative Coins will include surcharges—$35 for each gold coin, $10 for each silver coin, and $5 for each half-dollar clad coin—which are authorized to be paid to the NPF. The funds are to be used for projects that help preserve and protect resources under the stewardship of the NPS and promote public enjoyment and appreciation of these resources. "When fully realized, the potential impact derived from the commemorative coin sales will be tremendous," said Shafroth. "The funds will improve trails, introduce more young people to the parks, and connect our citizens to the history and culture of our nation." The gold coin obverse (heads side) features John Muir and Theodore Roosevelt with Yosemite National Park’s Half Dome in the background. Inscriptions are "LIBERTY," "2016" and "IN GOD WE TRUST." United States Mint Sculptor-Engraver Don Everhart designed and sculpted the obverse. The gold coin reverse (tails side) features the NPS logo, with the inscriptions "UNITED STATES OF AMERICA," "E PLURIBUS UNUM" and "$5." Everhart also designed and sculpted the reverse. 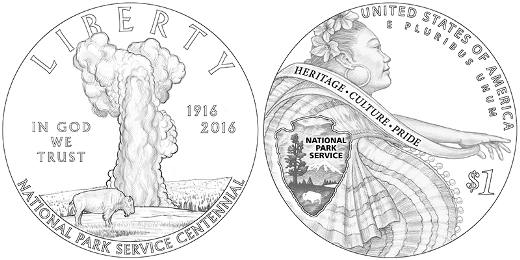 The silver coin obverse features Yellowstone National Park’s Old Faithful geyser and a bison, with the inscriptions "LIBERTY," "NATIONAL PARK SERVICE CENTENNIAL," "IN GOD WE TRUST" and "1916-2016." United States Mint Sculptor-Engraver Joseph Menna designed and sculpted the obverse. The silver coin reverse depicts a Latina Folklórico dancer and the NPS logo, representing the multi-faceted cultural experience found in America’s national parks. Inscriptions are "UNITED STATES OF AMERICA," "E PLURIBUS UNUM," "$1" "HERITAGE," "CULTURE” and "PRIDE." The reverse was designed by Artistic Infusion Program (AIP) artist Chris Costello and sculpted by United States Mint Sculptor-Engraver Jim Licaretz. 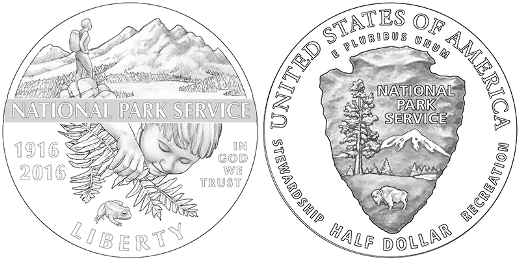 The clad half-dollar obverse features a hiker discovering the majesty of the wilderness and a small child discovering a frog hiding in ferns, celebrating the diversity and breadth of the NPS. Inscriptions are "LIBERTY," "2016," "IN GOD WE TRUST," "1916" and "NATIONAL PARK SERVICE." The reverse was designed by AIP artist Barbara Fox and will be sculpted by United States Mint Sculptor-Engraver Michael Gaudioso. The clad half-dollar reverse features the NPS logo, with the inscriptions "UNITED STATES OF AMERICA," "E PLURIBUS UNUM," "HALF DOLLAR," "STEWARDSHIP" and "RECREATION." The reverse was designed by AIP artist Thomas Hipschen and sculpted by United States Mint Sculptor-Engraver Charles L. Vickers. The United States Mint will announce the coins’ release date and additional pricing information prior to their release in 2016. The commemorative coin is one of many incredible ways to celebrate the 2016 centennial. During his recovery, Brad Phillips, the man who was rescued via helicopter, was interviewed by WBIR from his hospitable room. You can view this short clip here. Over the past week the colors in lower elevations have really come alive. There is now a mixed bag of bright yellows and reds with still some green. High elevations along with some middle elevation areas have completed their cycle and lost their leaves. Lower elevation areas like Oconuftee, Cataloochee, Greenbrier, Cosby, Elkmont, and Deep Creek are alive with color. Little River Road will probably offer the best driving experience over the next seven to ten days. Depending on the weather, these areas should continue to have vibrant colors for the next week to two weeks. Some recommended low elevation hikes include Deep Creek to Indian Creek Loop Trail, Gabes Mountain Trail, and the Old Surgarlands Trail. You can read the full report on the national park website. If you need any help on where to hike this fall, please take a look at our fall hiking page. And if you do plan to visit the Smokies this fall - or even during the upcoming Holiday Season - please take a few moments to check out our Accomodations Listings for a wide variety of lodging options in Gatlinburg, Townsend, Pigeon Forge and the North Carolina side of the Smokies. According to recent postings and photos published on the Great Smoky Mountains National Park Facebook page, fall colors have reached their peak at the middle and lower elevation of the park. Since rain is expected to move into the area on Sunday and Monday, now is the time to get out and enjoy the autumn colors while you can. In fact, the forecast for tomorrow is absolutely perfect for a hike in the park. If you need any help on where to hike tomorrow or Saturday, please take a look at our fall hiking page. And, if you do plan to visit the Smokies this fall - or even during the upcoming Holiday Season - please take a few moments to check out our Accomodations Listings for a wide variety of lodging options in Gatlinburg, Townsend, Pigeon Forge and the North Carolina side of the Smokies. Great Smoky Mountains National Park wildlife biologists remind the public to allow bears to forage undisturbed on natural foods during this critical feeding period before winter hibernation. Bears depend on fall foods such as acorns and grapes to store fat reserves that enable them to survive winter. This year, these foods in the park are extremely rare leading bears to move long distances in search of food. Many bears have been reported well outside the park boundary including several sightings in busy, downtown communities and neighborhoods. Recently, a mother bear with a GPS-monitoring collar and three cubs traveled over 20 miles from the Elkmont area of the park to downtown Sevierville, TN. Local residents are reminded to keep residential garbage secured and to remove any other attractants such as bird feeders and pet foods. In addition to greater movement in search of food, bears are also foraging on less-desirable mast such as hickories and walnuts. 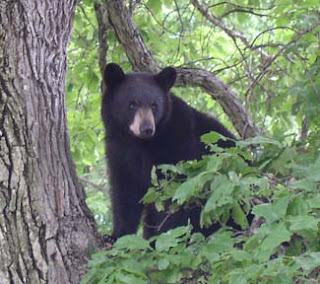 Park staff have reported as many as eight different bears visiting a single hickory tree to feed on nuts. Park officials are temporarily closing areas around these scarce food sources to allow bears access to forage. Visitors are reminded to respect these closed areas to give bears an opportunity to eat undisturbed and build up fat reserves for the winter. Photographers are reminded to use telephoto lenses to capture photographs and to remain at least 50 yards from bears at all times. Feeding bears is illegal and all food waste should be properly disposed of to discourage bears from approaching people. Feeding, touching, disturbing, and willfully approaching wildlife within 50 yards (150 feet), or any distance that disturbs or displaces wildlife, is illegal in the park. If approached by a bear, visitors should slowly back away to put distance between the animal and themselves creating space for the animal to pass. Middle elevation areas throughout that park are nearing peak this week. Lower elevation areas still have a lot of green, but recent cold nights and sunny days have jump started color development in the foothills. High elevation areas are now past peak and most trees have already lost their leaves. However, views from Newfound Gap Road and other high elevation roads such Heintooga Ridge and Balsam Mountain will be beautiful as you look down into colorful middle and lower elevation areas. Foothills Parkway and roads in the communities surrounding the park should also provide good viewing opportunities over the next week or so. Visitation to Great Smoky Mountains National Park is up 5.5 percent through September 2015. Over 8 million visitors have come to the park so far this year. The increase has led to record months of visitation in both May and September with visitation surpassing 1 million visitors during each month. In September, the park welcomed 1,081,773 visitors, the most ever since the park began recording monthly visitation in 1979. With over a million visitors during each of these shoulder-season months, the park is well above the ten-year average of 750,000 visitors during May and 900,000 visitors during September. The increased visitation has also led to increased use of the park's two main visitor centers, campgrounds, and backcountry campsites. Overall, overnight camping in the frontcountry is up 8.7 percent in 2015, while backcountry camping is up 11.4 percent. "The Smokies continue to be one of the premier destinations in the southeastern United States," said Superintendent Cassius Cash. "This record setting visitation on our shoulder seasons reminds us that no matter when you come to the Smokies the opportunities for exploration, relaxation, and discovery are endless whether you're on one of our busy scenic roadways or less traveled areas." This year's record setting visitation follows the park's busiest year in 14 years. In 2014, 10,099,275 visitors came to the national park, an 8% increase over 2013. The numbers were spurred by strong July and August visitation as well as the highest October visitation in 27 years. Great Smoky Mountains National Park officials invite the public to a special birds of prey program presented by Doris Mager on Sunday, October 25 at 10:00 a.m. The program will be on the porch of the Oconaluftee Visitor Center. Known as "The Eagle Lady", Ms. Mager has been working with raptors for over 35 years. She has cared for over 80 injured eagles and hundreds of other raptors, housing up to 36 birds at one time. In 1983, she established an educational and research group called Save Our American Raptors (SOAR). Part of her research work included conducting aerial surveys of bald eagle nesting sites for scientists studying the population and habits of birds in the wild. Ms. Mager continues to travel throughout the U.S. doing educational programs with a 34-year-old great horned owl known as E.T., screech owl, and American kestrel. 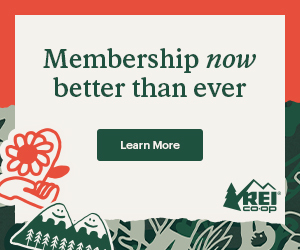 Mager's program provides a unique opportunity for visitors to see raptors up close as they learn about features and habits of these fascinating birds. After eight years of providing programs at in Great Smoky Mountains National Park, this will likely be Ms. Mager's last appearance as she will be moving away from the area. The Oconaluftee Visitor Center is located on Newfound Gap Road approximately 2 miles north of Cherokee, N.C. For more information about the program, please call the Oconaluftee Visitor Center at (828) 497-1904. 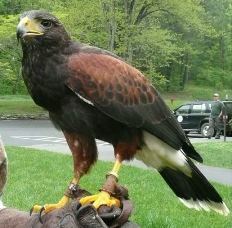 For more information on birds in the park, please see http://www.nps.gov/grsm/naturescience/birds.htm. 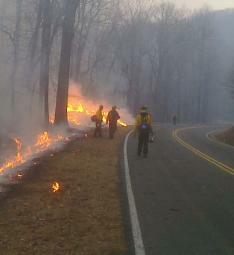 Great Smoky Mountains National Park officials have announced a series of controlled burns within the Cades Cove and Cataloochee areas of the park. Both operations could begin as early as Monday, October 26th. Park fire management officials are planning a series of controlled burns within the Cades Cove area of the park, weather permitting, which could begin as early as Monday, October 26, and may continue intermittently through mid-November. Fire managers have identified multiple fields totaling approximately 300 acres for fire treatment. These controlled burns will reduce woody encroachment into the fields, help perpetuate native herbaceous species, reduce exotic plant species, and maintain the historic landscape of the cove. During prescribed fire operations, visitors may experience brief delays due to activities adjacent to the loop road or smoke. Fire managers ask that motorists reduce speed in work zones. If smoke is present, keep windows up and headlights on, and do not stop on roadways. Staff members will be present at overlooks to answer questions during operations. The loop road and historic structures will remain open to visitor use but brief delays or temporary closures of adjacent roads and trails may occur to ensure public safety during operations. Visitors should expect to see fire activity and smoke during prescribed burns. Great Smoky Mountains National Park fire management officials are also planning a 600-acre prescribed burn in the Canadian Top project area adjacent to Cataloochee Valley in North Carolina. Weather permitting, burn operations could begin as early as Monday, October 26, and may continue intermittently through early November. The burn unit is located on Bald Top and Jesse Ridge adjacent to the Little Cataloochee Trail between Davidson Branch and Mossy Branch. Fire managers plan to use a series of low-intensity controlled burns over a number of years to restore the oak woodlands on the area's upper slopes and ridges. This will be the second time fire has been used on this site as part of that restoration effort. Fire and drought-tolerant natural communities are important to overall ecosystem health, and they are in decline throughout the Southern Appalachian region. The controlled burn will be conducted by national park staff and is being funded by the Rocky Mountain Elk Foundation. Is the Smokey Bear Ad Campaign Effective? 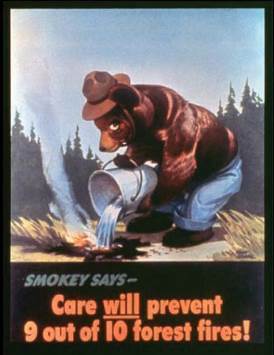 So I was listening to late night radio the other night when I heard the latest Smokey Bear PSA for the umpteenth time. For some reason the tagline phrase at the end of the commercial, “9 out of 10 wildfires are started by humans”, stood out for me this time. We’ve all heard that statistic a million times, but have you ever considered that this is basically the same stat that’s been cited since the launch of the Smokey Bear campaign? So the question that came to mind while lying in bed that night was how is it, or why haven’t we seen a significant decrease in the number of human-caused wildfires since the Smokey Bear campaign was launched more than 70 years ago? No doubt the campaign has been highly successful in raising awareness of the issue over the years. According to the Ad Council (which runs the Smokey Bear campaign), “96 percent of U.S. adults recognize him, and 70 percent are able to recall his message without prompting.” That's an incredible statistic – one that every marketer in the world wishes they could claim! 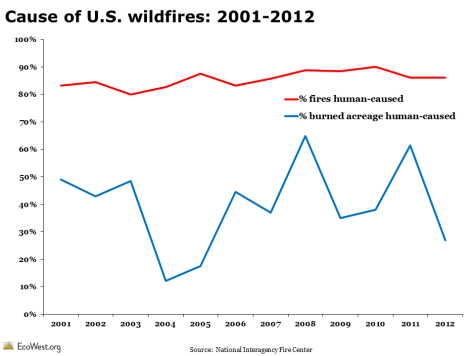 But why haven’t we seen an improvement in the number of human-caused wildfires over the last 70 years? It’s very possible that 1944 was an outlier year. An average from that time period, with valid data using the same collection methods and from same sources as used today would be the only correct way to measure this claim. Which brings me back to my original question: why haven’t we seen an improvement in the number of human-caused wildfires over the last 70 years? Is it possible that our collective conservationist ethic hasn’t improved, or is less now than in years past? It would seem unlikely, but I don’t have any data to support or refute this assertion. Is it a generational phenomenon? In other words, is it a lesson, or an awareness issue, that each generation has to learn as they come of age? A review of the statistics on the ages of all the human-caused wildfires over the last 70 years would prove (or disprove) that theory. Unfortunately I don’t have access to those statistics, but they would be interesting to see, and would be the only logical reason why we haven’t seen an improvement in this problem over the last several decades. Indeed, it does appear that the Ad Council tries to target younger people, especially when you consider the campaign tactics that have been used over the years. However, can you really say that the campaign has been successful when the needle hasn’t moved in 70 years? What are your thoughts? Is there another reason for the problem that I'm overlooking? Is there a more effective way of dealing with the issue? Is the Ad Council wasting our federal tax dollars on a problem it hasn’t fixed? High elevation areas are past peak as of this week with most trees having already lost their leaves. Anywhere above 4,500 feet fall colors are nearly all the way through their cycle and any leaves left will drop soon. However, views from Newfound Gap and other high elevation overlooks will be beautiful as the middle and lower elevations begin to pop with color over the next few weeks and into November. Weather forecasts for significantly lower overnight temperatures through the weekend will accelerate the middle and lower elevations transition. There are several locations along Newfound Gap Road, Heintooga Ridge and Balsam Mountain Roads, and the Foothills Parkway where visitors will begin seeing this progression over the next 10-14 days. There is still plenty of green in the middle elevations, which may cause a patch fall color presentation. 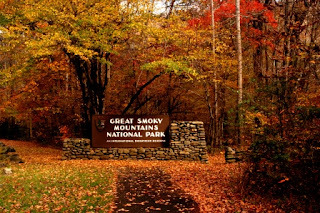 The Great Smoky Mountains National Park is the most visited National Park in the United States with over 9 million guests per year, and this year you should be one of them! With breathtaking views, fascinating wildlife, and a variety of activities to choose from, the park has something for everyone to enjoy. Horseback riding in the Smokys is an exciting way for guests to take in the incredible sights and is a beloved activity by locals and visitors alike. During your stay at the many cozy and relaxing Gatlinburg cabins available, you can explore the beautiful scenery and learn about the history of the area, all while sitting atop a gentle and majestic creature. Whether you’re an experienced equestrian or have never even been in the saddle, this will be an experience in the mountains that you won’t soon forget. When you go horseback riding in Gatlinburg, be sure to check out some of our favorite trails. For a peaceful walking tour with stunning mountain scenery, try horseback riding with Smoky Mountain Riding Stables. Perfect for riders of all skill levels, their well-trained horses will lead you through trails inside the park where you’ll be surrounded by lush woods and flowing mountain streams. You might even come face-to-face with native wildlife including wild turkeys, deer, or black bear! You can also receive 45 minutes of free horseback riding with Smoky Mountain Riding Stables when you stay with Mountain Rentals of Gatlinburg for four days. It’s a great deal and a great way to experience the Smokys like never before. Experience over 6,000 acres of exceptional woodland when you take a horseback tour with Cades Cove Riding Stables. Located in the East Tennessee section of the Great Smoky Mountains, Cades Cove has rich natural and cultural history that will be explained by your knowledgeable guide. You’ll venture trails that transverse 5,500-foot mountain peaks, and will have plenty of chances for awesome photos. Plus, their horses have been handpicked for calm temperament, athletic ability, and willingness to please, so you’re guaranteed to have the best riding experience possible. You and your family will love choosing from one of three amazing rides when you visit Smokemont Riding Stables. Travel through forests and across the Oconaluftee River during their hourly ride, or take their waterfall ride where you’ll climb a steep mountain trail for magnificent views of the scenery and a waterfall. On the four-hour ride, you and your horse will follow a wooded trail along the river and can stop to admire two cascading waterfalls. It’s the perfect way to spend the day exploring the natural beauty of Gatlinburg. Now that you know some of the best places to horseback ride in the Smoky Mountains, it’s time to start planning your trip! With over 550 miles of trails open to horses, riding through the Great Smoky Mountains National Park is the perfect way to spend the day in Gatlinburg. Fall color continues to progress in the high elevations of the park. Many high elevation areas (above 4,500') are near, to slightly past, peak this week. Areas around Newfound Gap are colorful now. There is still a significant amount of green at the higher elevations though, which means color will continue to develop over the next few days. Views along the first half of Clingmans Dome Road and in the higher reaches of Newfound Gap Road should be good though early next week. Middle and low elevations are still predominantly green with a scattering of fall color here and there. But signs of change are becoming more noticeable. Some vibrant reds have developed on dogwoods, sourwoods, and a few maples. We're also starting to see a bit of yellow developing. The vivid red leaves of Virginia creeper vine are very noticeable climbing tree trunks now. Overall however, there's not a great deal of fall color in the lower elevations yet -- the season here is still two or three weeks away. Due to an active rock slide the Point Lookout Trail will be closed. Pisgah National Forest is asking hikers to avoid this area for your own safety and the safety of personnel working to reopen the trail, as heavy equipment will be on the trail. The Pisgah National Forest, McDowell County and the Town of Old Fort are working to have the slide removed and the trail reopened in time for fall colors. A follow up notice will be issued when the trail is reopened. The main fall leaf season is still several weeks away (mid to late October), but color has begun to develop over the past week in high elevation areas. Many birch trees are showing muted yellows, and species such as witch hobble, sumac, and blueberries are sporting red leaves at higher elevation. It's still early in the season though, so colors should continue to develop over the next week or two along the crests of the mountains. At low to middle elevations, dogwood trees have a reddish cast that will develop into brilliant reds later in October. Species such as sourwood and red maple are also turning red. And the brilliant reds of Virginia creeper vine can be seen climbing the trunks of many trees. Overall however, the forests are still very green at these elevations. There's not a lot fall color to see yet -- just scattered trees here and there. Great Smoky Mountains National Park officials announced the closure of the Whiteoak Sink area effective now through March 31, 2016 to limit human disturbance to bat hibernacula and help hikers avoid interactions with bats. Park biologists will be monitoring the site throughout the winter collecting population, ecological, and behavioral data that will inform resource managers developing a long-term protection plan. An extended closure through late spring may be recommended if the winter data suggests such an action would increase the chances for survival of a significant number of bats. The Whiteoak Sink area is primarily accessed from the Schoolhouse Gap Trail between Townsend and Cades Cove. This closure includes the area bounded by Schoolhouse Gap Trail and Turkeypen Ridge Trail west to the park boundary. The Schoolhouse Gap and Turkeypen Ridge trails will remain open. Park biologists have reported dramatic declines of cave-dwelling bat populations throughout the park. The decline is thought to be due to white-nose syndrome (WNS). Infected bats are marked by a white fungal growth on their noses, wings, and tail membrane. The skin irritation damages skin tissue causing the bats to wake from hibernation during winter months. Once aroused, the bats burn energy at a much faster rate depleting stored fat. With no food source available during the winter, the bats soon die. Infected bats exhibit unusual behavior including flying erratically during the day, even during winter months, and diving down toward people. They may be seen flopping around on the ground around cave openings. The park is home to 11 species of bats including the federally endangered Indiana bat and the Rafinesque's big-eared bat which is a state listed species of concern in both Tennessee and North Carolina. Bats play a significant role in maintaining ecological balance as the primary predators of night-flying insects. Biologists estimate that an individual bat can eat between 3,000 to 6,000 insects each night including moths, beetles, and mosquitoes. Great Smoky Mountains National Park is cooperatively working with other parks and federal, local and state agencies across the country to protect bats and manage cave habitats. In an effort to prevent the unintentional spread of WNS by people, the park closed all of its 16 caves and two mine complexes to public entry in 2009. Ongoing research in the Smokies includes monitoring bat populations in the winter during hibernation and tracking bats in the summer to determine habitat use. A recent plan released by the U.S. Fish and Wildlife Service aimed at stabilizing the dramatic decline of the Indiana bat identified hibernacula found in the Sinks as one of only 13 sites across the country identified as critical habitat for this endangered bat. Wildlife biologists have determined that giving the bats the chance to survive includes establishing protective zones surrounding critical habitat caves. Humans are not susceptible to WNS because the fungus requires a cold body temperature to survive, but skin-to-skin contact with bats should be avoided due to other transmittable diseases such as rabies. Bats are the only mammal species in the park that have tested positive for rabies. According to the Centers for Disease Control and Prevention, the transmission of rabies virus can occur from minor, seemingly unimportant, or unrecognized bites from bats. For human safety, it is important not to touch or handle a bat. The Department of Health and Human Services recommends that individuals should seek immediate medical attention if they have had skin-to-skin exposure to a bat. Join Friends of the Smokies and fitness expert Missy Kane once again for another series of hikes this upcoming fall. Each Wednesday throughout the month of October, Missy and Friends will hike a different trail in the Great Smoky Mountains. The cost is $20.00 per hike, with aspecial gift and free membership to the Friends of the Smokies being provided by Friends and Missy. You must register by calling 865-541-4500 (Covenant Call Center) as space is limited. Now celebrating it's 17th year, Get on the Trail with Friends and Missy has raised more than $140,000, with proceeds going towards the support for the preservation and protection of Great Smoky Mountains National Park. 1. Camping is prohibited unless it is in an authorized area. 3. Follow horse riding rules and regulations as posted. 4. Do not build / maintain a campfire or stove fire. 5. Follow car parking rules and regulations as posted. 6. Use of bicycle, motorcycle, or motor vehicle of any type is prohibited. 7. Area is closed at sundown and opens again at sunrise. Great Smoky Mountains National Park rangers remind visitors that graffiti not only detracts from the natural beauty of the park, but can also permanently damage irreplaceable resources. Park resources including one of the best collections of log buildings in the eastern United States, backcountry hiking shelters, live trees, stone walls, bridges, and tunnels have all suffered from a range of small markings with ball point pens to elaborate markings with permanent marker to lewd and offensive spray paint messages that leave the park in worse condition. Park rangers and volunteers educate visitors about the lasting implications of defacing the park's natural and cultural resources through education programs, signs, and graffiti-removal program. Unfortunately, graffiti can seldom be removed from log structures without destroying historic wood which makes removal virtually impossible. "Bob Was Here" signs were installed at a variety of locations within the park to help deter the park's 10 million visitors from leaving permanent marks on structures and long trails that damage park resources. "The staff at Great Smoky Mountains National Park remains committed to preventing and removing where possible graffiti in the park," said Superintendent Cassius Cash. "The National Park Service, our neighbors and visitors, have an equal responsibility to ensure that this park is preserved unimpaired for the next generation." Those caught tagging the park can face serious consequences including arrest. Those arrested could face fines of up to $5,000 and six months in jail. Last month, five men were arrested at the tunnel at the end of Lakeview Drive near Bryson City, NC for defacing park property. "We appreciate the hard work of the park rangers for cracking down on people who mark or deface the peoples' Park," said Swain County Commissioner David Monteith. "People who visit our National Park should not have to put up with that." For more information about participating in the park's volunteer program, please visit the park website athttp://www.nps.gov/grsm/getinvolved/volunteer.htm. To provide information regarding graffiti in the park, please contact the park at (865) 436-1230.